While diamonds might be a girl’s best friend, pearls have been recognized as specially prized gems for centuries longer than any cut stone. Like any jewelry of value, pearls require proper care to keep them looking good. Here are a few guidelines that will ensure that your pearls’ luster lasts a lifetime. If you notice your pearls look dull or dirty, you can easily clean them in distilled water using very mild baby soap and a soft cloth. Then rinse the pearls in distilled water, pat them dry and lay them out until the string is completely dry. Gently wipe pearls with a soft cloth to remove any dirt before putting them away. Pearls are a soft gem and should be stored away from other objects that may scratch the pearls’ surface. Wrap the pearls in a soft cloth, or place in a soft pouch. 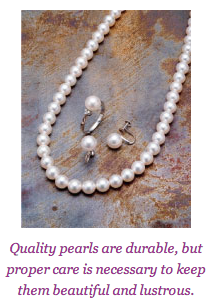 Do not store pearls in an airtight package because pearls need moisture. If the environment is too dry, the pearls may crack. Keep pearls away from chlorine, bleach, vinegar, hairspray, ammonia, perfume, and cosmetics, as these substances will damage the pearl surface. Make sure to put pearls on after you have finished spraying perfume or hairspray and putting on makeup. Restring pearls on a regular basis to maintain a clean and strong necklace. Be sure to have each pearl knotted separately with silk so they do not rub together and erode the pearl nacre. If pearls are very small, knots between each pearl may not be desirable or necessary.